guess for those who missed ohm 50% promo (50% off 2 mth fully redeemed , independent retailer), can consider the 2nd choice geneco (free AMI installation, has own power generation arms) or sembcorp (highest savings if consumption is >450kWh, has own power generation arms). I think all these 3 no hidden charges. Pacific Light fixed plan and peak/off-peak plan also no other hidden charge i think, but its discount-off plan charges transmission loss factor. Correct me if wrong. I strongly suggest the relevant authorities upgrade their website for easier comparison before this OEM rolls out to the other areas. The current website is worst, how can a Smart Nation has such website??? what's so bad about SP billing? oh i forgot to include, that is, assuming ohm ends their 22% after 6mth (or change the 22% to eg 10-15%), what other 2nd/3rd choice plans will you go for .. I'm assuming their 22% will not last longer than 6mths lol..
so im reading Jurong640 will go for maybe Geneco peak/off-peak. What about your 3rd choice? 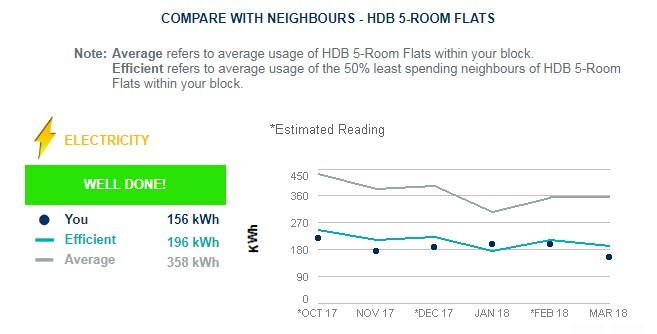 My third choice would be different as my usage is above 500-530kWh. The 450kWh cap for Sembcrop is abit risky. The oem comparison tool also does not list non standard plans (i.e those that do not fall under fixed, discount or peak/offpeak) which may be better for certain people. Simply Ohm gets me 24% not including any promo. not using aircon, just using fans and air purifier during sleep. though my vacuum cleaner is switch on 24/7, schedule every morning to auto vacuum the floor. Last edited by mosmos; 25-03-2018 at 04:26 PM..
BTW... anybody here using desktop PC and is running 24/7? Hows ur elec bill like? I see, hence i can conclude that aircon is really a huge electricity bugger. Using fans really can save alot. But for me, we living low floors, it can be very hot and no wind at night. Even on fan, it's still humid and sweating. This would risk a lot of people falling into traps such as Transmission Loss Factors, etc. What I believe all retailers should do in the Fact Sheet is that they should list what charges will be incurred, rather than redirecting people to another fact sheet or T&C pages. For now as i'm studying at home. Desktop PC is turned on from 10am to 12am. But not everyday as there are night classes. Plus aircon during day and night, 500kWh a mth.